A voltage regulator is used to hold the voltage of a circuit at a predetermined value, within a band which the control equipment is capable of maintaining and within accepted tolerance values for distribution purposes. Regulators may be installed at substations or out on distribution feeders on poles, pads, or platforms or in vaults. Voltage regulators are essentially autotransformers, with the secondary (or series) portion of the coil arranged so that all or part of its induced voltage can be added to or subtracted from the line or incoming primary voltage (across which the primary or exciting portion of the winding is connected). The voltage variations are accomplished by changing the ratio of transformation automatically without deenergizing the unit. There are two types of voltage regulators in use in distribution systems: the induction regulator and the tap-changing-under-load (TCUL), or step-type, regulator. The first is usually limited to circuits operating at 5000 V or less and is being rapidly replaced by the latter, employed where relatively larger amounts of power and higher voltages are involved. In the induction type of voltage regulator, the primary (high-voltage) winding and the secondary (or series) windings are so arranged that they rotate with respect to one another (Figure 12-1). The primary coil is usually the stator and the secondary coil the rotor, the direction of rotation generally depending on whether the incoming voltage is to be raised or lowered. The voltage induced in the secondary or series winding will depend on the position in relation to the primary winding. Depending on the position, the induced voltage can add to or subtract from the input voltage to obtain the outgoing voltage. During the rotation of the primary coil, the moving magnetic field can cause a large reactance voltage drop in the secondary. To dampen (or cancel) this effect, a third coil is mourned at right angles to the primary coil on the movable core and short-circuited on itself. The moving primary coil will induce a voltage in the third coil which will, in turn, set up a moving magnetic field of its own, which will tend to oppose that set up by the motion of the primary coil. The reactance of the regulator unit is thus kept essentially constant. 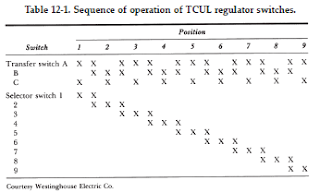 The TCUL, or step-type, regulator is also essentially an autotransformer, and is connected in the circuit in the same manner as the induction regulator. This type does not employ rotation of one of the coils, but changes voltages by means of taps in the primary coil, as shown schematically in Figure 12-2. The portion of the coil with taps is a separate part of the primary coil with arrangements included for a reversal in its connection so that the voltage within that portion of the primary coil can be added to or subtracted from the voltage in the rest of the primary coil. Each tap is changed by the opening and closing of an associated “selector” switch. To avoid disconnecting the transformer from the line each time a tap is changed, the taps are so arranged that two adjacent taps are connected through a small autotransformer each time the tap change is in progress. The midpoint of this “preventive” autotransformer is connected to the primary coil, as illustrated in Figure 12-3. A small air gap is inserted in the core of the autotransformer to reduce the size of the magnetic field, which could cause an excessive voltage drop in the coil. Small circuit breakers, known as transfer switches, make and break the circuit under oil. The selector switches are always closed while the corresponding transfer switch is open, and opened while the transfer switch is closed. In this design, three transfer switches and one selector switch for each tap are required for operation. The transfer switches are often contained in a separate compartment attached to the main tank of the regulator so that they may be maintained without the necessity of draining the oil from the entire regulator unit. The oil in this compartment may be more readily contaminated because of the frequency of the switches’ operation. The sequence of operation of both the selector and transfer switches is shown in Table 12-1. The switches are operated in proper sequence by a motor-operated mechanism which may be controlled manually or automatically. A time-delay device prevents short-duration dips from operating the control relays.